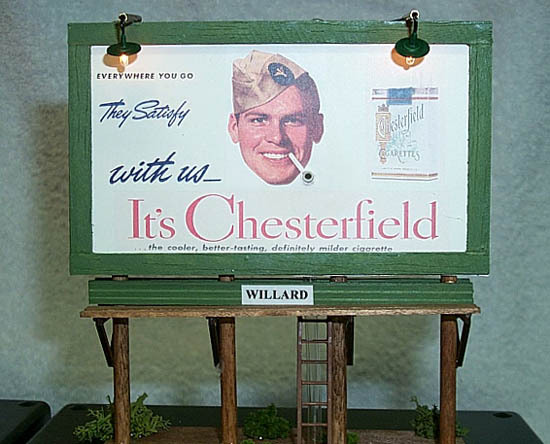 This Billboard features a retro 1930's - 1940's cigarette advertisement of Camel or Chesterfield cigarettes (your choice). The #025 is illuminated with two brass mounted lamps and a Midwest laser-cut hand-stained wood structure that supports the billboard. The billboard frame is accented with a flat green paint that really evokes this bygone era. Two advertisements are available. The Camel woman or Chesterfield man is smoking a cigarette that features real smoke blowing from the end of the cigarette. Included is a fan driven smoke unit with large fluid capacity. Either model is available with a Camel or Chesterfield cigarette advertisement. Please specify when ordering.